ChilliKids - new summer shoes for little twinkle toes! ChilliKids – new summer shoes for little twinkle toes! When it comes to warmer months and the start of summer, bright shoes and kids go hand in hand. 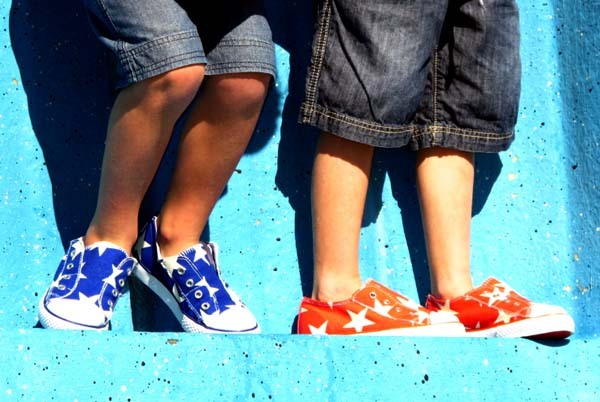 ChilliKids make it super easy to deck the kids’ feet out in fun and affordable shoes. We love ChilliKids here at Babyology. I adored their last offerings and now have my eye on a pair of these starry delights. The Kobe (pictured above) is a perfect unisex shoe and has a fantastic star print in coral or royal blue that both boys and girls are sure to adore. It’s available in sizes 22 through to 36 but be warned, these are a limited edition so if you want a pair, get in quick! Just for the girls is the very cool Amanda shoe (pictured below). Almost a gladiator style, the girls are sure to want to pound the pavement or playground in these trendy ankle strapped shoes. They even have a pretty floral lining for comfort and are available in sizes 26 to 36. Kobe and Amanda shoes are both priced at $34.95. Find your closest stockist at ChilliKids or order direct – for the month of October, there is free shipping on all full-priced items!